The passenger compartment remained stable in the frontal offset crash. 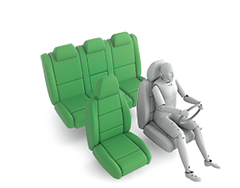 Dummy readings indicated good protection of the knees and femurs of the driver and passenger dummies. Audi showed that a similar level of protection would be provided to occupants of different sizes and to those sat in different positions. In the full width rigid barrier test, protection of the driver dummy was good for all body areas apart from the chest, which was adequately protected. Protection of the chest of the rear passenger dummy was marginal, and that of other body areas was good. In side barrier test, the A4 scored maximum points, with good protection of all critical parts of the body. However, in the more severe side pole impact, dummy readings of rib compression indicated marginal protection of the chest. When the pole test was repeated on the A5 Coupé, the driver's door opened and the score for adult occupant protection has been penalised to reflect this behaviour. 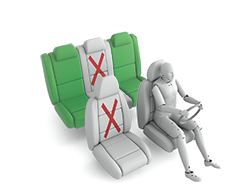 The seats and head restraints provided good protection against whiplash injury in the event of a rear-end collision. A geometric assessment of the rear seats indicated good protection there too. The new A4 has an autonomous emergency braking system as standard. This operates from the low, city speeds at which many whiplash injuires are caused and showed good performance in Euro NCAP's tests. Both child dummies were sat in rearward-facing restraints In the dynamic impact tests. The test results showed good protection for both the 1½ and 3 year dummies and the A4 scored maximum points for this part of the assessment. The passenger airbag can be disabled to allow a rearward-facing restraint to be used in that seating position. Clear information is provided to the driver regarding the status of the airbag and the system was rewarded. All of the restraint types for which the A4 is designed could be properly installed and accommodated in the car. The Audi A4 has an 'active' bonnet. Sensors in the bumper detect when a pedestrian has been struck and the system triggers actuators which lift the bonnet, creating more space between the surface and the hard structures in the engine compartment. Audi showed that the system worked robustly for many pedestrian statures and across a broad speed range, so the system was tested in the deployed position. Good or adequate results were recorded on almost every test location. The protection provided to the leg by the bumper, and that provided to the pelvis, ranged from marginal to good. The A4's standard-fit autonomous emergency braking system recognises pedestrians as well as other cars. Euro NCAP will start to assess the performance of such functionality in 2016 so the system cannot be rewarded here. Electronic stability control is standard, together with a seatbelt reminder for the front and rear seats. The standard-fit autonomous emergency braking system operates at highways speeds and performed well in Euro NCAP's tests. A driver-set speed limiter is standard equipment while a speed limit information function is an option that did not qualify for assessment as it is not expected to be sold in sufficient numbers. Likewise, a lane departure warning system is available as an option but is not expected to be fitted in sufficient numbers to qualify for assessment. 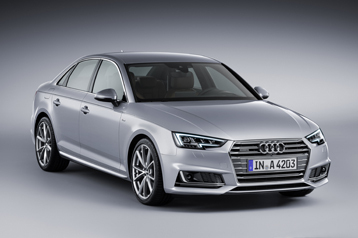 The Audi A4 and the A5 are based on the same platform and share much of the structure that is relevant to safety. As the A5 Coupé has two side door instead of four, additional tests have been performed to confirm that the 2015 rating given to the A4 is valid also for the A5 Coupé and the A5 Sportback. However, the rating does not apply to the A5 Cabriolet as its mass is too much more than that of the A4 on which the original tests were done.